Spoilers for Wednesday’s episode of Legion ahead. 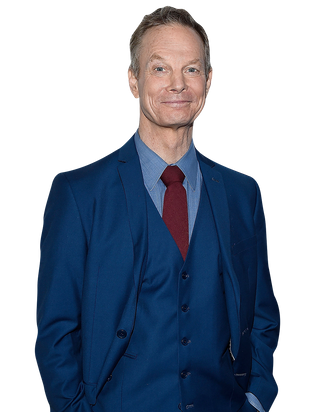 As is true for much of FX’s Legion, it’s a bit hard to describe Bill Irwin’s role. The veteran actor and professional clown (no, seriously) plays a scientist named Cary, but he also sort of plays a young woman named Kerry. Well, he doesn’t exactly play her — she just lives inside of Cary’s body and occasionally pops out, at which point she’s played by Amber Midthunder. Cary and Kerry are vital members of the team of mutants that fights for truth and justice in the show, but the nature of their relationship is supremely and delightfully odd. In tonight’s episode, Legion reveals the origin of Cary/Kerry: They were born at the same time in the form of Cary, and that, as a child, Kerry suddenly appeared before him and the two have been aware of one another ever since. He ages at a normal rate, but she only ages when she’s outside of their collective body, meaning by the time Legion starts, she’s significantly younger than him. When Cary fights, his body moves in tandem with hers, leading to a fascinating scene where we see him doing the motions of battle while alone in a room. Vulture caught up with Irwin to talk about constructing that scene, eschewing special effects, and why Legion showrunner Noah Hawley reminds him of Georges Seurat. What was it like shooting the scene where Cary and Kerry are moving in unison in different locations? It’s the first time we’ve really seen how interconnected they are. In essence, it’s this geeky scientist who’s too old and maybe was never disposed to go out and be a warrior. He’s back holding down things at the lab, but he perceives how the other part of him is out in the world as a young, eager warrior. Nobody’s more eager than Amber’s character, Kerry, in these early episodes. She’s so anxious to get out there and do some fighting. All I did was try to build a reality where, back in my protective laboratory, I was sort of like a father but sort of like a sibling, telepathically and imaginatively getting the story of what was happening to her out there and feeling it viscerally so that I’m receiving the blows she’s getting and no longer quite giving as much out in the field of battle. It was a wild scene. How detailed was the choreography? Was there room for you to improvise? It was extremely detailed because the choreographer and the director and the whole stunt team had a very interconnected sense of what moment was relating to what moment. In the end, television storytelling pressures are so great that, as I watched the episode, I thought, To a viewer who wasn’t there as we shot it, it’s probably more fragmentary. Or what’s the kind of painting? Georges Seurat? Impressionistic. That’s the deal with Noah Hawley: Seeing the narrative maybe a second or third time is when you get your traction. It’s a very physical scene, and you have a long history as a very physical performer, thanks to your background as a professional clown. How much did your clowning experience play into your work on Legion? Well, I’m still looking to answer that question every day we produce. But here was a very moving thing: When I sat down to breakfast with Noah, a year and a half ago, he said, “My parents took me to see you when I was 14.” He named the show and I saw right away what the difference in our ages was, but I was so moved that these traditions and this shtick that haunted me and was driving me in my 30s spoke to him when he was a gawky teenager. Lo and behold, these come back at you. He said, “I have a feeling you should play this character I have in mind. He’s your age and a geeky white guy with a certain feeling for Rube Goldberg scientific construction. But, by the way, he has a Native American warrior living inside of him.” So I just kept eating breakfast and did my best to take all this in. The key to nailing this character is developing a rapport with Amber, who’s half of you. How did you two build that? How do you find the balance between treating Kerry as a sibling and as a child? She and Cary are bound like siblings, but one of them has gotten older and the other has stayed relatively young. One thing I said to Noah — as soon as it was out my mouth I realized, That was a blinding flash of the obvious and he’s way ahead on that — but I said, “You would never want to feel any kind of romantic connection between these two characters. That’s just icky. There’s a 40-year difference. But is it paternal or is it sibling?” As we worked on it, it got to be a blend of things that is sibling-like, especially at certain moments. Wait until you see the later episodes, where they’re sort of at odds with each other. But, in my mind, it is grounded in a fatherly concern. I’m not a very good father in that sense, but the mythic chord it touches is father-child. I’m getting tired and ready for X-Man retirement, maybe, and she is just coming into her own. Can you tell me about shooting your other memorable bit in the episode, when Cary and Kerry divide their bodies in a bathroom? How did you create that effect? We didn’t see much of Noah until he came and actually directed some sequences at the very end. And so the sequence, he hadn’t actually written it back in the days of production. It was something he wanted to add. He said, “This isn’t going to be an effect. This is gonna be, in essence, an acting trick.” So they cut a slit in my bathrobe, and her hand came down through. It wasn’t a special effect, or a motion-control or motion-capture exercise. It was two actors sliding arms down a garment and having to feel out where the camera was. And by God, when I saw it finally, I realized he’d seen that in his mind’s eye the whole time. It felt like a stage bit. I felt like, Oh, we’re doing a play here for a second.